In support of the mission by the U.S. Department of Energy's Advanced Research Projects Agency-Energy (ARPA-E) to "overcome long?term and high?risk technological barriers in the development of energy technologies that ensure America's energy security and technological lead," STLE hosted a workshop titled Tribological Opportunities May 19-20, 2016, following our 71stAnnual Meeting & Exhibition in Las Vegas. The purpose of the workshop was to explore opportunities in advanced tribological science and engineering for energy technologies across a wide range of practical application sectors. 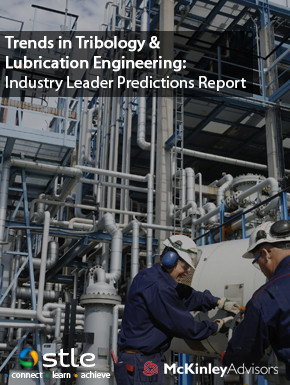 Discussions were held to talk about industry needs and where new tribological science and engineering principles might assist in helping to accelerate technological advances in how surfaces and lubricants interact during relative motion for energy savings. The workshop was augmented by an online survey, Can Tribology Save a Quad? which was distributed to the broader tribology community and in consultation with STLE and other professional societies. You can find results of these efforts in this final report. Order a free digital version of the full report by adding to your online cart. Delivered via email. Please be certain you email address is correct in your record prior to ordering for instant delivery.